The construction industry hiring resource ConstructionConnection.com has announced a partnership with Lynda.com aimed at educating its members in various fields of construction matters. We are thrilled to offer access to classes on Lynda.com to the Construction Connection community. Competition for construction jobs is high, and by offering this resource to our members we are helping them gain a competitive edge. Construction Connection, the online network of construction industry professionals and construction hiring resource, announced a partnership with Lynda.com to help construction professionals further their education. Lynda.com is an education website where individuals can take classes online to learn about various subjects and software like MS Excel, Computer-Aided Design (CAD) and Building Information Modeling (BIM). 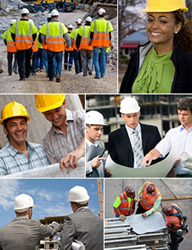 For Construction Connection members, this is an immense resource for adding skills to their portfolio. In addition to the new partnership with Lynda.com, Construction Connection recently rolled out new features further aimed at improving construction hiring, including the Everything DiSC Workplace Profile, certified background checks and employment verification, and Prove It! by IMB tests. Each of these resources is expected to help the construction community and improve transparency between individuals and construction companies. DiSC Profiles give insight into individuals’ communication and working styles to help construction project managers build more cohesive teams. The background checks and employment verification resources save hiring managers time and assure that they are interviewing quality candidates for their available construction jobs. Tests from Prove It! by IBM allow individuals to demonstrate their proficiency at using specific software like Quickbooks and Microsoft Office to construction company owners. With the new partnership with Lynda.com, now individuals who are not already skilled in certain software can watch video tutorials and learn new skills. Construction Connection also features an educational blog discussing various subjects related to the construction industry, as well as Safety Toolbox Talks, access to industry leaders, and much more. For more information on these new features and construction resources, visit ConstructionConnection.com.